32-team final site: Option B: 48 teams, 16 byes to final site and 16 opening round games. 16-team final site: Option A: 64 teams, 16 opening sites and 4 teams each. 8-team final site: Option A: 64 teams, 8 opening sites and 8 teams each. "There's just a lot of unknowns right now," Dakota Wesleyan University Athletic Director Jon Hart said. "We will make whatever adjustments we need to and try to remain as competitive as we can and hold our tradition." The details on host sites and tournament format will be determined at a later date. Midland University men's basketball coach Oliver Drake said coming up with the appropriate format is the next step. Drake sits on the 10-person taskforce committee. 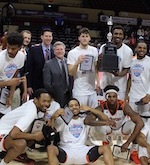 "Let's really try to be on the front end of it and try to make the format of the national tournament-which I think would be best for our association as a whole-let's just try to move forward with it and do the best we can to set it up where we don't skip a beat because I think NAIA basketball is outstanding," Drake said. "It's something we don't really want to mess with." Drake has been adamant about having 64 teams qualify for the national tournament and a 32-team final site event. "I think one of the things that we really fought for-me personally-on the task force, is to maintain 64 teams," Drake said. "When it's been two divisions, 32 teams have gone-32 in Division II and 32 have gone in Division I." He's received similar feedback when talking to coaches and other NAIA officials. "We want to see 64 teams in the tournament and we want to see 32 at the final site, however, that format gets to those final two points, I think our coaches as a whole would accept," Drake said. 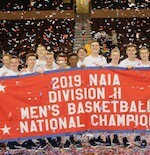 DWU men's basketball coach Matt Wilber has guided the Tigers to four straight national tournaments-three in Branson, Missouri and last March in Sioux Falls. Wilber has enjoyed the 32-team final site tournament. "It gives it a tournament feel and it doesn't reduce the student-athlete experience," Wilber said. "It's not taking away opportunities and you start talking, 'Hey we go to an eight-team end site, an Elite Eight or a Sweet 16 end site.' That's reducing student-athlete participation experience for what our kids are getting." On the women's side, DWU women's basketball coach Jason Christensen said the Great Plains Athletic Conference and other strong leagues in the Midwest would lose their representation at the national tournament in certain scenarios. "I just don't like it because I don't think you are going to get your best teams in the national tournament," Christensen said. "That was definitely one of my concerns. They are still trying to look at ways of doing it the right way. I don't think they've got that part figured out yet. I just don't think it's a good thing." Currently, the NAIA Division I men's tournament is in Kansas City, Missouri, and has been since 2002. The Division I women's tourney is in Billings, Montana. Also, the Division II men's tournament was in Sioux Falls this past season after moving from Branson, Missouri. The Division II women's tournament has been in Sioux City, Iowa, since 1998. GPAC Commissioner and NAIA Division II women's tourney director Corey Westra feels strongly Sioux City would be in the running to host the women's tourney once the merger goes into effect. "I think our centrality of Sioux City certainly helps our cause and it's gone well for us, too," Westra said. "We've done it well and have a good reputation. I am not real worried about that part of it, to be honest. I have been very confident in what we've done with the tournament. I do feel that we will be the host-one way or the other." Westra added Kansas City would be the leading contender to host the men's tournament. Currently, there are 94 Division I men's and women's basketball teams. On the Division II side, there are 136 men's teams and 134 women's teams. In NAIA Division I, 34 percent of the women's and men's teams are going to the postseason. In Division II, 23.9 percent of men's teams go to the postseason and 23.5 percent of the women's teams go to the postseason. "It's a big decision for the NAIA," Westra said. "But I think as with all our decisions, we look at the data and at some point you have to decide what's best for the organization and hopefully these decisions are made with the thought of what's best for your future."